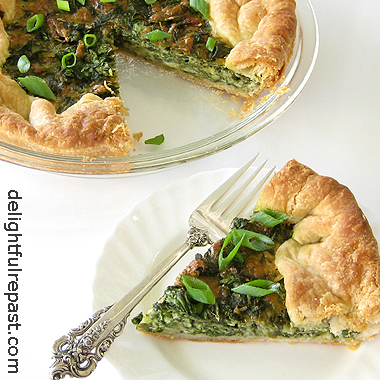 Rustic Spinach Tart is a recipe I developed decades ago when I was a vegetarian. Though it contains an egg and a half, it is not eggy, not a quiche. I made sure of that - because it's so easy for a vegetarian to get completely quiched-out! I recall sprinkling the egg-washed crust with sesame seeds, but that's strictly optional. In fact, sometimes I skip the egg wash as well, as I did this time. If you like a shiny crust, though, do the egg wash. Many spinach recipes call for frozen spinach, but I've only ever used fresh spinach. And I don't precook the spinach or the green onions, so the filling comes together quickly. You can use any pastry you like, rolled out to a 15-inch circle, but Mr Delightful loves this pastry. If you're a fan of phyllo or frozen puff pastry, those work too. 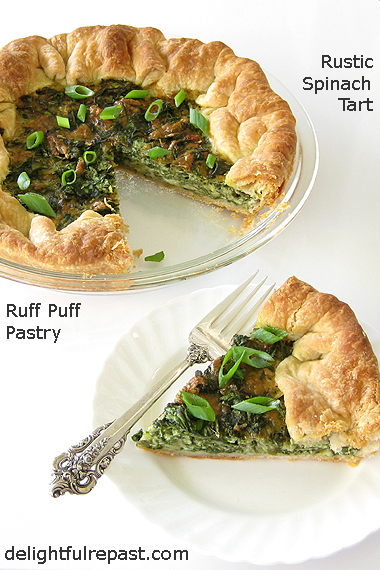 When cut into 16 or more wedges, the tart makes a great hors d'oeuvre or teatime savory. 2 In cup, combine lemon juice or cider vinegar and ice water. Pour liquid over all of flour mixture and pulse for three 1-second pulses. It will be very crumbly. Don't worry about it. You might not need the entire 1/3 cup of liquid, so maybe just start with 1/4 cup and see how it feels. 3 Turn the crumbly dough out onto lightly floured 12-inch square of parchment paper, and roughly shape into a 10-by-5-inch rectangle. Using a bench scraper or just the paper, carefully fold one third of the rectangle toward the center, then fold the other end to the center, like a letter. (It will still be a crumbly mess at this point.) Rotate the dough 90 degrees, then press (no need for rolling pin until after dough has been chilled) the dough again into a 10-by-5-inch rectangle. Repeat. After that third turn, cover and place in the freezer for 20 minutes. 4 On lightly floured surface, with floured rolling pin, roll the chilled dough into a 10-by-5-inch rectangle. Fold into thirds. 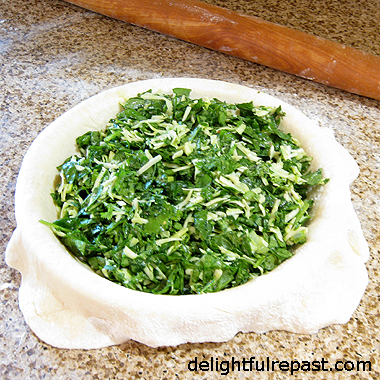 Rotate the dough 90 degrees, then roll out and fold again. Roll the dough out once more and fold again into thirds. Roll out and fold once more, for a total of 4 turns. 5 Chill for two hours before using, or wrap well and refrigerate for up to 3 days or freeze for up to 2 months. 6 Preheat oven to 425F/220C/Gas7. Spray a 9-inch pie plate with cooking spray. Chop spinach, green onion and cilantro, put in a large bowl. Shred cheeses. 7 On floured piece of parchment 15 inches long, roll out pastry to a 15-inch circle, place in 9-inch pie plate set on a large baking sheet and put it in the refrigerator while finishing the filling. Don't try to make the pastry a perfect circle; this is supposed to be rustic. 8 Stir cheeses into spinach mixture, then stir in the flour. In small bowl, beat together egg (set aside 1 tablespoon for pastry egg wash), milk and seasonings. Stir into spinach mixture. 9 Turn filling into pie shell and fold in the edges of the pastry. Don't try to make it even or perfect. Add a teaspoon of water to the tablespoon of egg; brush it on the pastry just before it goes into the oven. Bake for 15 minutes; reduce heat to 375F/190C/Gas5 and continue baking for 35 minutes. Adagio Teas has a wide selection of full leaf loose teas and herbal tisanes. But if you prefer teabags, you'll love their pyramid teabags that contain the same quality full leaf tea and that are roomy enough to give the leaves room to unfurl properly. They have herbal tisanes and decaf teas, iced teas and flavored teas, and green, white, matcha, oolong and pu-erh teas, as well as the black teas I prefer. The Adagio Teas I've tried so far are all black teas and all loose teas (except for the Ceylon Sonata Iced Tea Pouches): Irish Breakfast, Earl Grey Bravo, Earl Grey Moonlight, Darjeeling Sungma Summer and Fujian Baroque. I've not yet tried the Ooooh Darjeeling, which is an oolong. I'll start with the Ceylon Sonata Iced Tea. Of course, you can steep it hot just as you would for hot tea; but I did it the cold-brew way and loved it. I just dropped 2 pouches into a glass pitcher with 2 quarts of water and refrigerated it for 12 hours. The result was the smoothest, most crystal-clear iced tea I've ever had. I will never make iced tea the hot-brew way again! 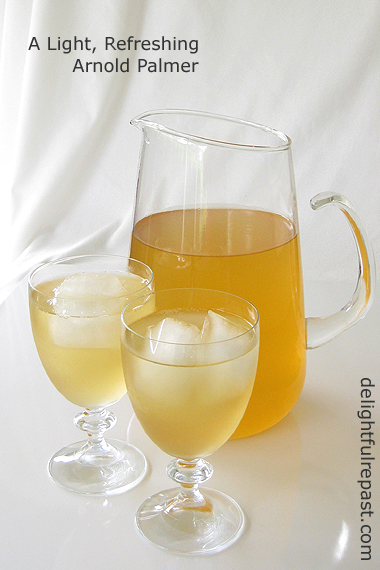 Even when I added the inadequately strained freshly squeezed lemon juice to make Arnold Palmers, the cold-brewed Ceylon Sonata iced tea remained very clear. 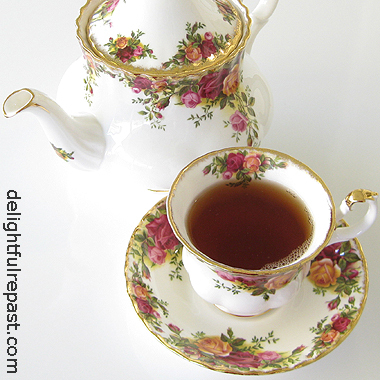 The next tea I tried was the Irish Breakfast, a seamless blend of the bright Ceylon Sonata and malty Assam Melody. Irish breakfast teas are sometimes a bit harsh without a good splash of milk, but I found myself drinking this one straight and loving it. Even when I was distracted (usually by the cat or something I was reading) and oversteeped it, it was good. 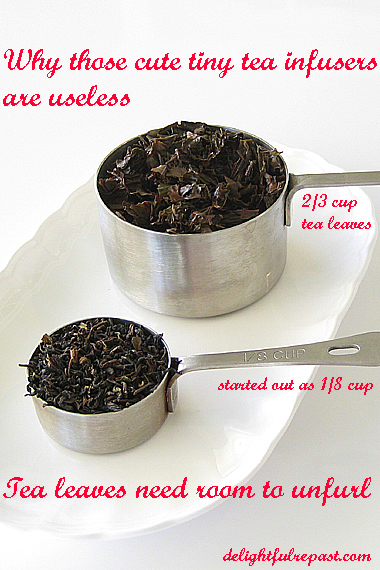 A teaspoon or other measure of one tea won't be the same weight for all loose leaf teas. Whenever you try a new tea, experiment with the amount of tea to water and the steeping time (3 to 5 minutes for black teas) to get the perfect brew for you. When I made this pot of Darjeeling Sungma Summer, I used 2 tablespoons (1/8 cup), which was 9 grams, with 28 ounces boiling water. I was happy to find that the infuser works in my new Old Country Roses teapot and was large enough to allow the 1/8-cup scoop of full leaf tea to unfurl properly. As you might have observed, I have no shortage of teapots, from 17 ounces to 3 quarts (It's a bruiser!). But for those tea-for-one moments throughout the day, you can brew a proper cup/mug of tea in this infuser cup, a lovely porcelain cup and lid with stainless steel infuser (photo below). It comes in white and eight other colors. The extra-fine stainless steel infuser is quite deep and works well in other mugs too and even some teapots. Of course, you can leave out the infuser when you're using teabags. Whether using the infuser or a teabag, the ceramic lid makes the cup act like a teapot and gives you a better brew. Update 07/26/17: Giveaway is now closed. 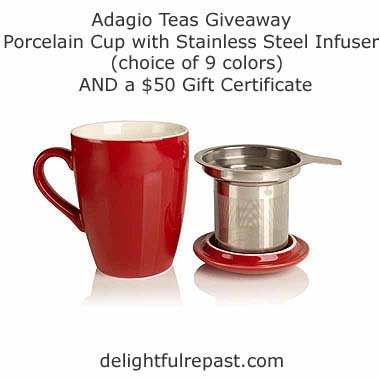 The winner of the giveaway will be sent the infuser cup in your choice of 9 colors and a gift certificate for $50 that will allow you to choose your own teas and other products. This giveaway is open to residents of the US, Canada, UK and Europe, 18 years of age or older. Leave a comment below (one entry per person); tell me which color infuser cup you'd like and perhaps your favorite kind(s) of tea. Please include your email address in the body of your comment. Must enter by 11:59 p.m. Eastern time Wednesday July 26. Winner will be chosen by random drawing and be announced here in the comments before noon Eastern time on Thursday July 27. If I don't hear back from the winner of the random drawing by noon Eastern time Sunday July 30, another drawing will be held and a new winner selected from the original entrants (those who commented before the giveaway deadline). 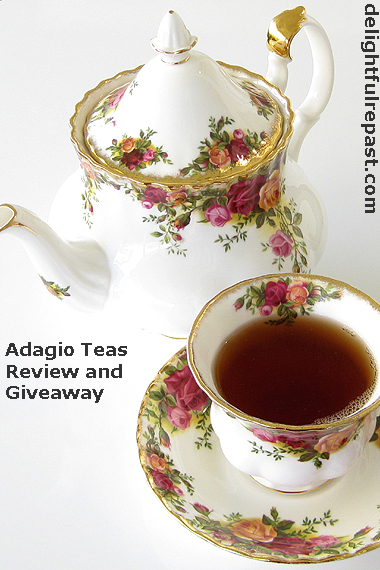 Disclosure: Adagio Teas provided product for review purposes and for the giveaway. The views expressed here are entirely my own. I always tell my readers what I really think! 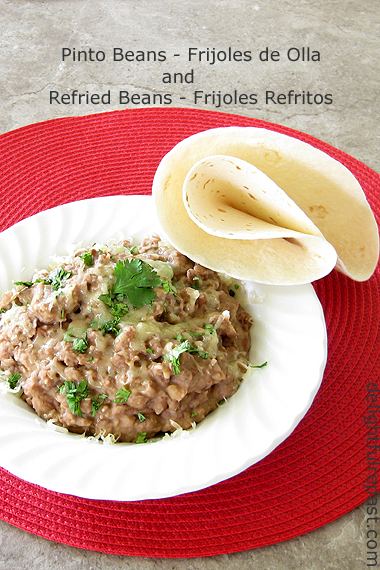 Though I had grown up eating pinto beans as soup beans, something my mother presumably learned from my father's side (the Southern side) of the family, we never had refried beans. That's something I began making on my own later. But recently, when I first thought of posting it, I thought I better consult with my Mexican food expert, Mimi, via her daughter, my friend Julia, as I did for Mexican Rice. Julia is not the big bean fan that I am, but she spoke to her mother about it so that I could get her "authentic" take on the subject. Turns out Mimi most often cooked a pot of beans, frijoles de olla, without going that step further of making refried beans (but more about that later). She kept a teakettle of hot water handy to add to the pot of beans when the water level went too low during the long cooking. I thought that was a fantastic tip! Beans take long enough to cook as it is without slowing down the process even more by adding cold water to the simmering pot. She used a little garlic, but I'm allergic to garlic and avoid it whenever I can. So I decided to throw in a small onion cut in half and just a tiny bit of cumin, red pepper flakes and oregano; not enough to notice, just enough to infuse a certain something into my garlic-free beans. I've done the overnight pre-soak and the quick-soak thing, but have found just cooking the beans in their unsoaked state works as well. I just bring the pot of beans to a boil, reduce heat and simmer until done. It may or may not take a bit longer; that really depends on the age of the beans. Usually I don't mind tending a pot of beans for a few hours, but it has been so hot this week I haven't wanted to be anywhere near the stove! So I decided to make my pot of beans in the slow cooker for the first time. And. I. will. never. cook. beans. any. other. way! Totally effortless! Note: If I were cooking beans in a pressure cooker, I would definitely presoak. Otherwise, you will end up with lots of split skins and blown-out beans. Update 03/21/19: Not true! 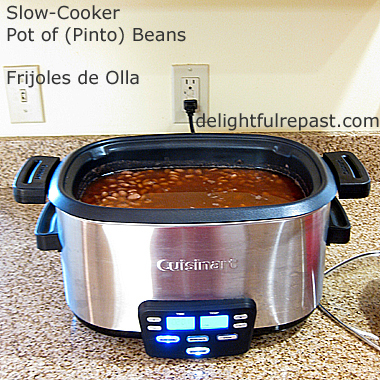 Got an Instant Pot in December and have just posted Instant Pot Pinto Beans. Sure, you can buy canned beans. But do the math first. 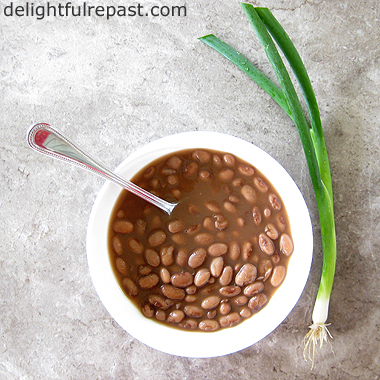 A pot of beans from 2 pounds of dried beans equals about eight 15-ounce cans of beans! You can freeze the beans in can-size portions or whatever size portion you need. I will never buy canned pinto beans again. 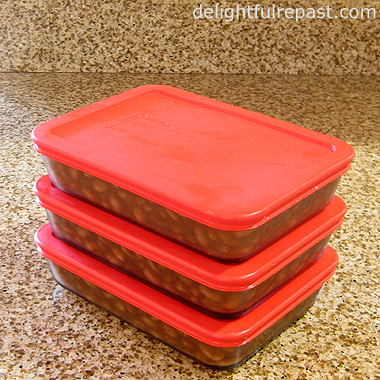 Cook a big pot of pinto beans, use some now and freeze the rest in meal-size portions. Frozen beans will keep for up to 3 months. The word "refrito" doesn't really mean "refried," but rather "well-fried" or something like that, the Spanish "re" being an intensifier rather than a multiplier. 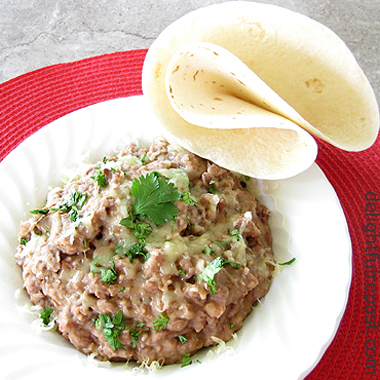 Some cooks prefer to use lard in their refried beans, but Mimi always preferred vegetable oil. Whenever vegetable oil is called for, I often use organic (non-GMO) canola oil. It's important to heat the oil very well before adding the beans. But be very careful when adding the beans and, especially, their liquid to the hot oil. I've made both bean recipes suitable for vegetarians and vegans. And, seasoned as they were, I didn't even miss the little bit of salt pork or fatty bacon I sometimes use. 2 After 6 hours, check the beans. If they are nearly done, remove the onion and add the remaining teaspoon of salt. Continue cooking for one hour; check for doneness. Mine were done at that point. 1 Heat oil in skillet over medium heat until oil is very hot. 2 Add the beans, then add the bean liquid very slowly and carefully. Fry until the liquid is thickening, about 10 minutes. 3 Mash beans in the skillet with either a potato masher or an immersion blender (take the pan off the heat while using the immersion blender), adding more bean liquid if needed. You can completely mash the beans to a puree or leave some whole beans. The beans will thicken as they sit, so add enough liquid to make them less thick than you want them to end up. Note: You can top the beans with queso fresco, if you like, but I prefer Monterey jack cheese and a sprinkling of chopped cilantro. And Homemade Flour Tortillas! 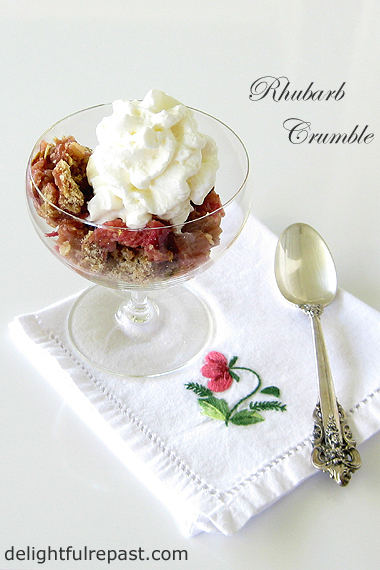 Rhubarb Crumble is a classic British dessert, made with a vegetable-slash-fruit originally from Siberia. It's associated with springtime, but I only just this week managed to get my hands on some. It's both hothouse-grown and field-grown in the US and has been cultivated in the UK since the 1600s. And yet the cashier at the natural foods grocery had to ask me what it was. It's such a "thing" in West Yorkshire that growers of Yorkshire Forced Rhubarb were awarded Protected Designation of Origin (PDO) status in February 2010 (Hey, that's when I started Delightful Repast!). Making this for just Mr Delightful and myself, I used less sugar than I've listed here in the recipe because we like sour. But most people will want to use at least this much sugar (many rhubarb recipes call for a great deal more), which comes in at just under my daily sugar allowance. Are you a rhubarb fan? Do you grow your own? What is your favorite way to use it? * Mature rhubarb is said to require more sugar than young rhubarb. 1 Preheat oven to 400F/205C/Gas6. Butter, or spray with cooking spray, a 1- to 1.5-quart baking dish. I used a Pyrex 1.5-quart loaf dish. 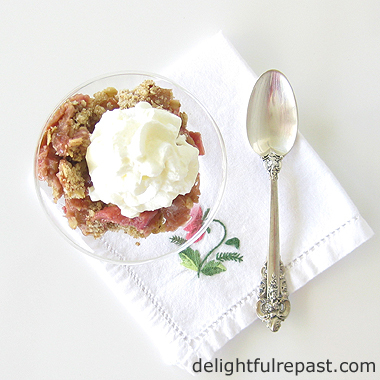 2 Scrub, trim and cut up rhubarb into 1/2-inch (1.25 cm) pieces; you should have about 3 cups. Add to 1.5-quart mixing bowl. Stir in sugar, vanilla extract, cinnamon and salt. Transfer to baking dish. 3 Wipe out mixing bowl, no need to wash it. Add flour and butter to bowl, and rub the butter into the flour, leaving some larger pieces of butter. Add oats, sugar, cinnamon and salt; mix lightly with fingertips. Pour loosely over rhubarb in baking dish; do not pack down. 4 Bake in preheated oven for about 35 minutes, or until rhubarb is bubbling and crumble is golden. Let stand 10 minutes before serving. Serve with lashings of Custard Sauce, softly whipped cream or vanilla ice cream.